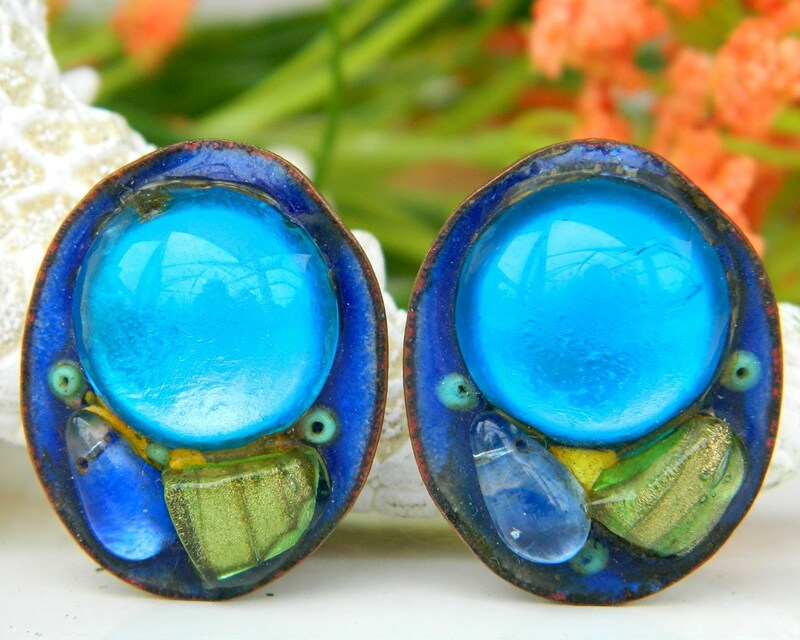 Vintage Andree Bazot Modernist Paris France Enamel Earrings Aqua Blue Green Foiled Copper Pieces Raised Clear Enamel Cookies Patent Pending Clips Hand Crafted Mid Century Modern This is a gorgeous pair of Modernist Earrings by the gifted artist Andree Bazot from France. She was one of the most famous enamellists of the postwar era. 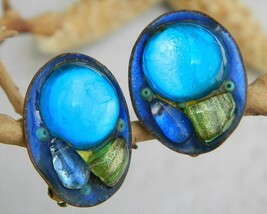 She is known for her freeform intricate design work with glossy enamel and original color palettes. Each earring is signed with her distinctive “B” on the earring back. The main feature of the oval shaped setting is a sparkling turquoise or aqua blue round cabochon. The color changes with the light reflection, from light to darker blue. Below the main cabochon are two smaller free form pieces. The one that looks blue in the pictures is actually clear but reflects the blue enamel behind it. The other is a lime green with gold flecks in it. There are also three little green beads below a clear layer. All of the glass or cookies are surrounded by the blue enamel. 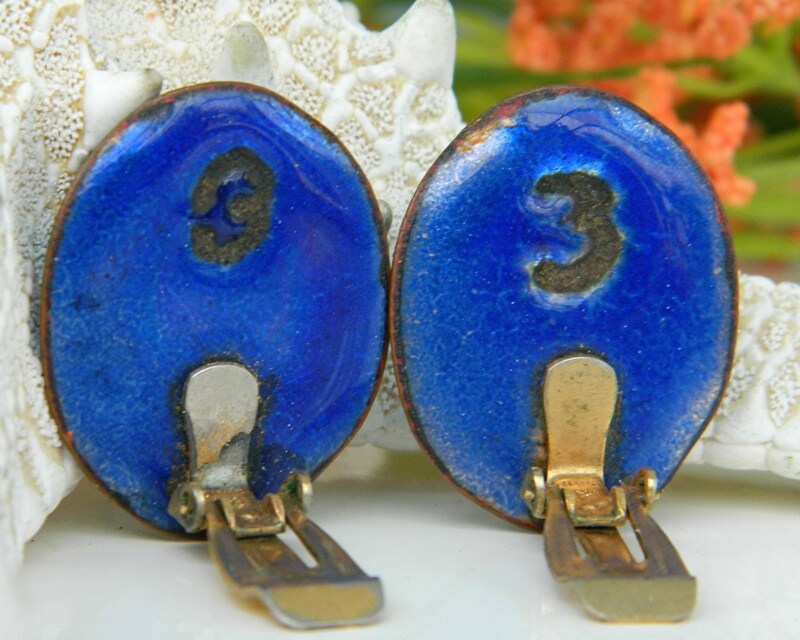 Even the backs are decorated in the deep royal or cobalt blue enamel, this is called counter enameling, it sandwiches the metal to prevent tension and cracking. They measure approximately 1 1/4 inches long and 1 inch wide. These are quite dimensional. The clip backs have Pat. Pend on them. 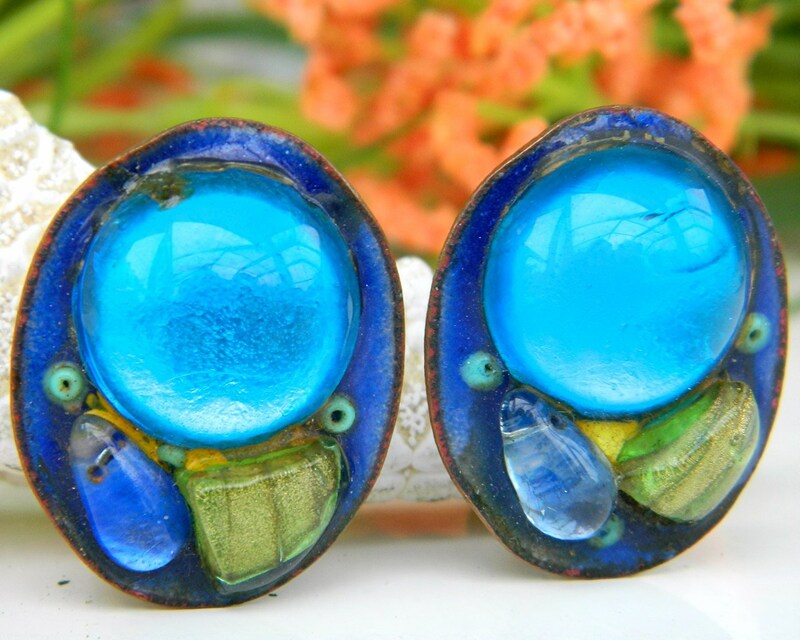 These earrings are from the late 1950s to early 1960s. Andree Bazot’s jewelry is unique and each one is one-of-a-kind. In creating the jewelry the clear enamel layer is fired onto a copper base, then followed by a layer of foil and then colored enamel with fused glass cabochons. They are in great vintage condition as you can see by the enlarged pictures. They could use a little polishing, but I leave that up to you. There is some slight finish wear on the inside of the clip base and some slight defects from the firing inside the fused glass cabochons. These would make a great addition to your collection of vintage postwar enamel jewelry. 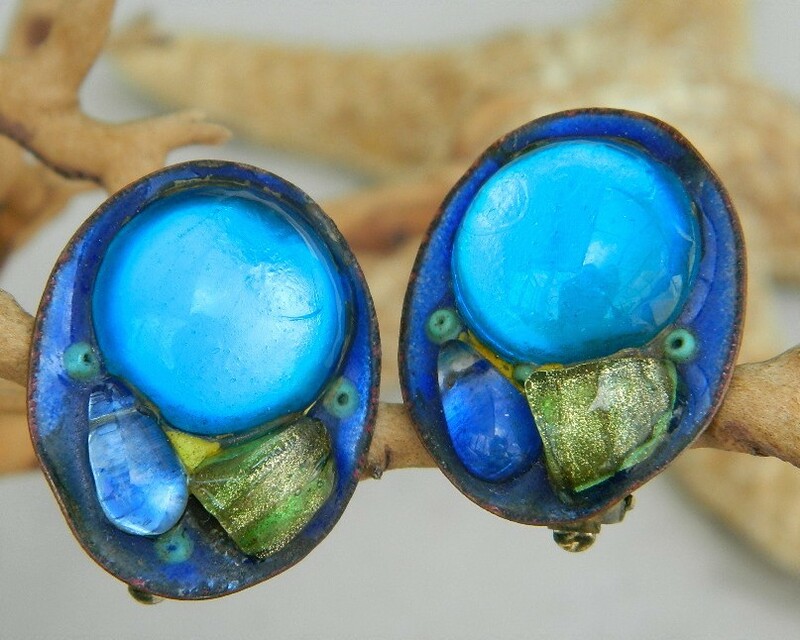 It is rare to find earrings by Andree Bazot, these are beautiful and unique. 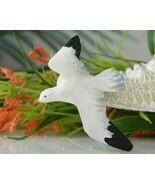 These will be sent 1st Class Mail with Tracking/Delivery Confirmation and Insurance. For more information about me and booth policies, click on Starfisher's Stars at the top of this page, it will take you to the main page of my booth. Thanks for visiting!